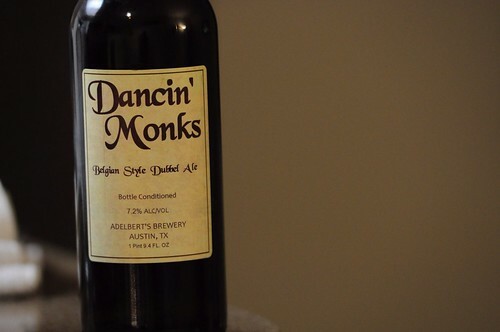 Adelberts Dancin Monks, originally uploaded by adambarhan. A: Pours a hazelnut brown color. Two finger white head forms and drops to a ring that sticks around. Lots of sticky lace is left behind. S: Toasted malts, toffee sweetness, some plums as well. Simple, but enjoyable. T: Toasted malts with a nice sweetness. Toffee, figs, plums. M/D: A medium body and carbonation. Creamy and smooth. Overall, very enjoyable if a bit simple. Very much worth a try if not familiar with the ATX brewery.